The Library has two galleries for exhibitions of different scale and style. Various library spaces are used creatively and flexibly for displaying artworks by professional artists as well as students. The Ping Yuan and Kinmay W Tang Gallery at the Library G/F entrance is the major exhibition venue in the Library. Located on the 1/F of the Library, the Gallery showcases the University Archives and Special Collections. Merged into spaces for study and shelves, artworks by HKUST students and artists are displayed under various programs. 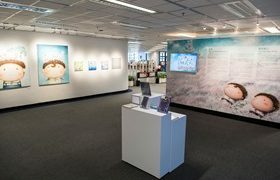 In particular, with Art Dimensions many students’ coursework in art courses are shown throughout different floors of the Library.